My old breeches. I have sold the 24inch and 26 inch waist ones, but the 28s still mock me on the shelf unit! Controversial I know but fly rugs for the majority of horses, especially those that wear rugs all winter and fly rugs all summer. Most horses just bred a good fly repellent (some horses have super sensitive skin I know). Women who forget to put their skirts on and wear tights (sorry, leggings) that clearly show their knickers. People who take over rugging to the max, I’m talking duvet, heavyweight on heavyweight rug plus stable boots plus snuggly hood etc. There’s plenty more but I’m aware I’m having a grumpy mood thanks to getting some very simple questions wrong on an exam earlier. Actually do you know what I really, really hate - people who don’t seem to understand that you need to get a horse properly fit before leaping into a competition (or hunt) - 4 weeks into work your horse definitely isn’t fit for a competition. But they can’t be bothered to take the time to do it right. people who leave their horses turned out 24/7 in rugs that don't fit or have missing straps so that rug ends up round their neck or slipped over to one side. Poor horses. sorry this is more of a random moan than a reply to the question asked by the OP. I don't suppose anyone actually likes rugs that don't fit properly. My horse arriving to come in completely covered in mud when I saw him 30 seconds before perfectly clean. People telling me I look tired when Iv'e just bloody well put some make-up on and done my hair. modern dressage (watching it although don't actually want to do it either, but yes including Carl etc). I dont do matchy matchy as such but it does my inner child good to kit black pony out in black and yellow accessories such as biscuits and Libby's reins . Food that is served on a roof tile. Too scrapy! What's wrong with a plate? *Cats...I don't understand the fascination and never will. Flea ridden, mangy murderous little shits. Worse still, endless videos of cats doing things? Are people genuinely that bored?! Luca monetas riding style, everyone seems to love him. I have to leave the room. I strongly dislike bum freezer jackets, fine on those tots doing show ponies in lead rein, 1st ridden and 12.2's, ridiculous on anyone else. Baler twine tied onto rings on the outside walls of wooden stables, when it's not been thinned out, why? Drop nosebands - if done up extremely tightly. Bits with loooong shanks and crank action (in the wrong hands). Spurs being used to dig into the horse's sides with every single stride they take. Rollkur or any form of gadget that ties the horse's head down into a fixed, overbent position. Sure no one loves this but as soon as the image of a horse is applied to a product the cost triples. When you no longer fit in your jodhpurs, ride in joggers until the Christmas season is over so you can buy new ones but realise how much comfier it is to ride in 4 quid joggers! But feel obliged to get jodhpurs as they are more correct! Liveryman Harmony clippers. I lost count of the number of times I nearly threw them across the stable yet seen so many people on here reccomend them. Lucky people! Cats are dicks. They look after themselves and are twisted, vindictive little barstewards! What's not to love about them?!?! Dogs on the other hand! Dogs are pathetic, they pander to you and want your attention and your praise all of the time! Leggings. I have nothing against leggings... but they are meant to be worn like tights- with a long top/jumper/shirt or a dress. They should not be worn like jeans. It’s basically like walking round in your tights. Not a good look for anyone. Children singing- I’m with whoever said that. Vile. Children’s choirs are even worse. People riding unbrushed horses, which is quite timely given the othe thread haha! I absolutely cannot abide seeing a horse go out to work covered in dried mud that could be brushed off in about 2 minutes. Dogs. Especially dogs that smell. Or dogs that are needy. Small ratty chav dogs. Dogs with no respect that leap up and try and lick your face. People who don't train their dogs. People that don't pick up the dog poo. The endless schooling and going round in circles in arenas that so many people seem to do with their horses. BORING!!!!!!!!! Welsh D's- given I have one, never again!! Loved the comment on a thread the other day about Welsh bi polar disorder it's so true! Plaiting. 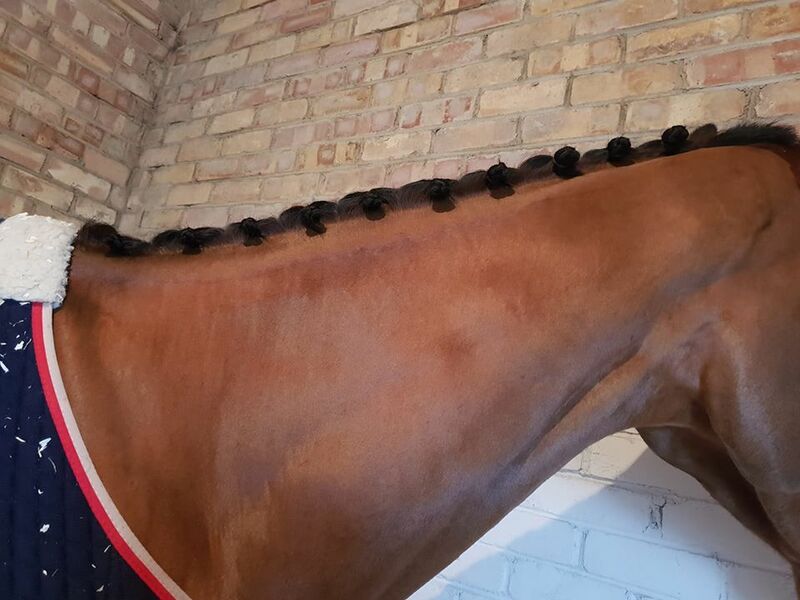 I think pulled manes look smarter than plaited ones. Christmas lights, especially houses that are fully lit up. Sensor light and streets lights that stay on all night-and hate light pollution. Moles that back fill the traps 😒. The dog that is currently whining to be let in, he never comes in until we have eaten cos he is a pain around food. Patches left on horses sides for the spurs when they're clipped. I know why it's done but it looks ugly! This drives me insane but for reasons other than yours! It will annoy others when they see it too! Full tails on anything that’s not a hairy or a native. Yuk. I like a pulled tail (albeit I rake to achieve it).